Fairfield is a fell in the eastern Lake District. 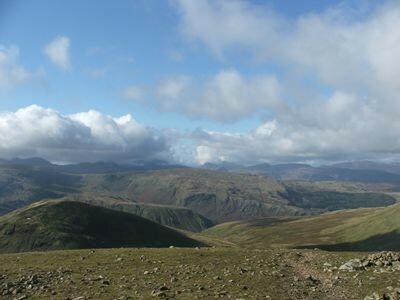 Fairfield is the highest point of the Fairfield Horseshoe, which is a classic circular ridge walk starting from Rydal or Ambleside that takes in all the fells that surround the valley of the Rydal Beck. Fairfield has a great range of camping and caravan sites as well as a great selection of attractions and things to do in the area. Check out the key information on the right and then explore the camping and caravanning sites near Fairfield listed below. Fairfield is most commonly climbed as the high point of the Fairfield horseshoe, a walk which has no agreed direction of travel. Coming from Great Rigg, the long grassy ridge heads directly for the summit, whilst the walker arriving from Hart Crag climbs up from Link Hause with a fine view of Scrubby Crag to the right, before the stony traverse of Fairfield summit. It can also be ascended from Grisedale Tarn up from Patterdale. For more Ascents of Fairfield please see Wikipedia Fairfield Ascents.